Carpet with a quality pad can do a very reasonable job of minimizing footstep noise to the space below. If the construction quality of the floor and ceiling system is above average you can expect the noise downstairs to be acceptable. Our soundproof carpet padding will outperform readily available products. 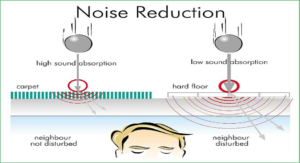 A much bigger issue for carpet soundproofing is the passage of loud noise through the air. Carpet and a pad, even the heaviest pad available, cannot block noise from loud kids, stereo/tv noise, floor to floor noise from bars, restaurants and commercial tenants. For convenience in comparison of different constructions, the sound transmission class (STC) rating condenses sound transmission information into a single number according to ASTM E-413. STC is fairly accurate for human speech; however, for low-frequency sound, such as a motor, fan or even music with strong bass, the perceived sound may be greater than that indicated by STC. When properly selected, carpet is an outstanding sound absorptive material as it absorbs airborne noise as efficiently as many specialized acoustical materials. As soon as carpet is installed over a hard-surface floor the impact sound transmission to rooms below is an obvious acoustical advantage. 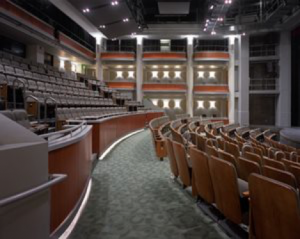 No other acoustical material performs the dual role of a floor covering and versatile acoustical aid. Understanding the acoustical values of carpet constructions and the combinations of specific carpet cushions is important. For convenience in comparison of different constructions, the sound transmission class (STC) rating condenses sound transmission information into a single number according to ASTM E-413. STC is fairly accurate for human speech. For low-frequency sound, such as a motor, fan or even music with strong bass, the perceived sound may be greater than that indicated by STC.